I love completing a project. It’s probably one of the reasons I ventured out to be my own boss. Completion isn’t a problem. I love how it feels when I send a project off and check it off the list. When we purchased a home, we were excited about the process of making it our own with all sorts of projects. We had never had a space to make entirely our own, so it was exciting to think about making a list, room by room. What I never expected was the amount of work it takes, the number of decisions that have to be made, and, on the flip side, what the reward feels like once it’s done. 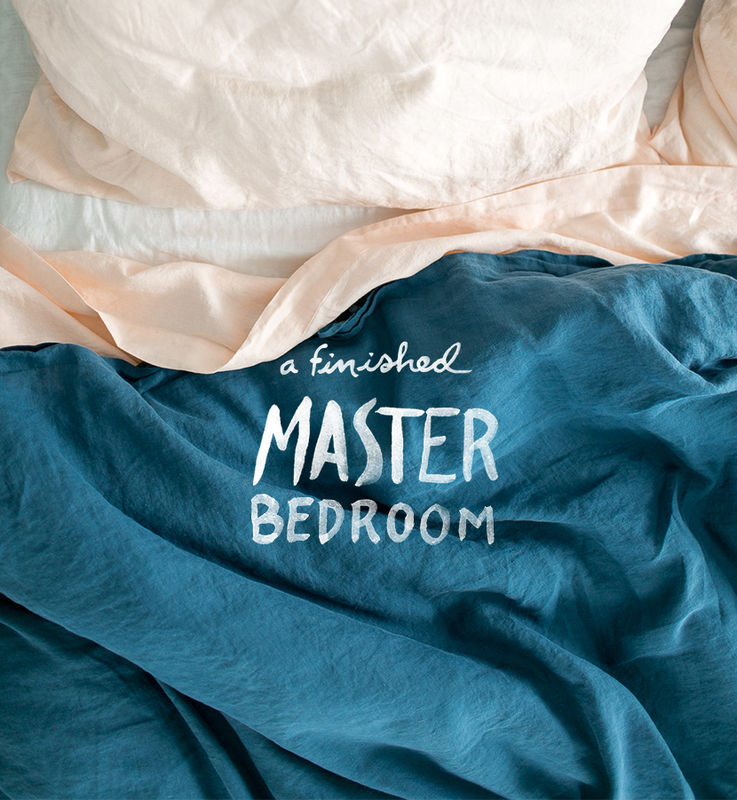 When you finish a home project, it feels like you conquered all the hardest things. I am not always great at communicating my ideas and bringing them to life. 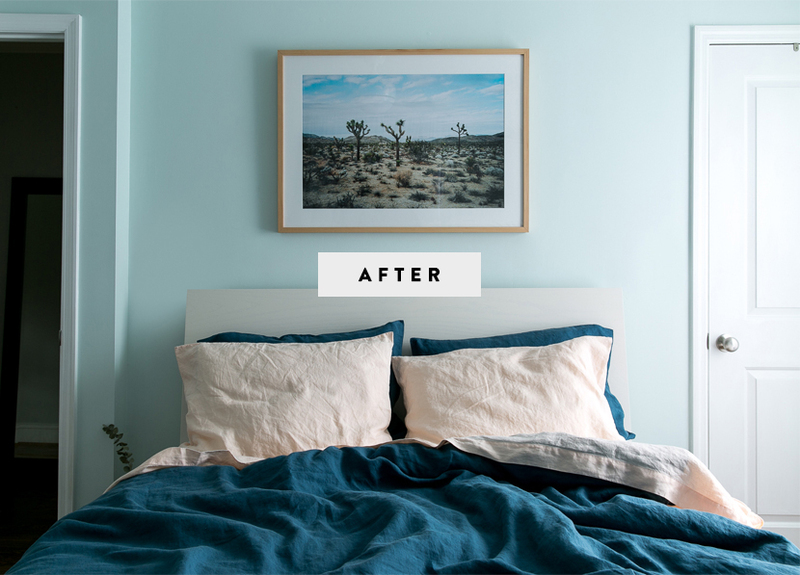 This is why I shared my strategy for making home dreams into a reality in our previous post with Behr when we came up with the vision for our master bedroom. Over the last month, we have pulled the room together. We chose paint colors, updated the fan, selected bedding, purchased a bed frame, picked artwork, painted the room (including trim), hung drapes, got a rug, and did a lot of rearranging of furniture in our home. All the decisions are now made, our room is complete and though a few things came together a little differently from our original plan, we LOVE it. 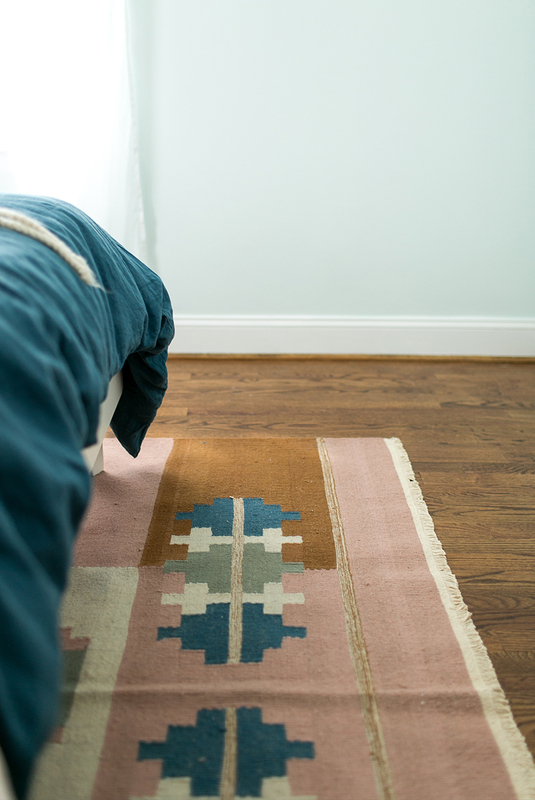 The light, airy, southwest feel mixed with a little laid back lifestyle is exactly what we wanted in our bedroom. 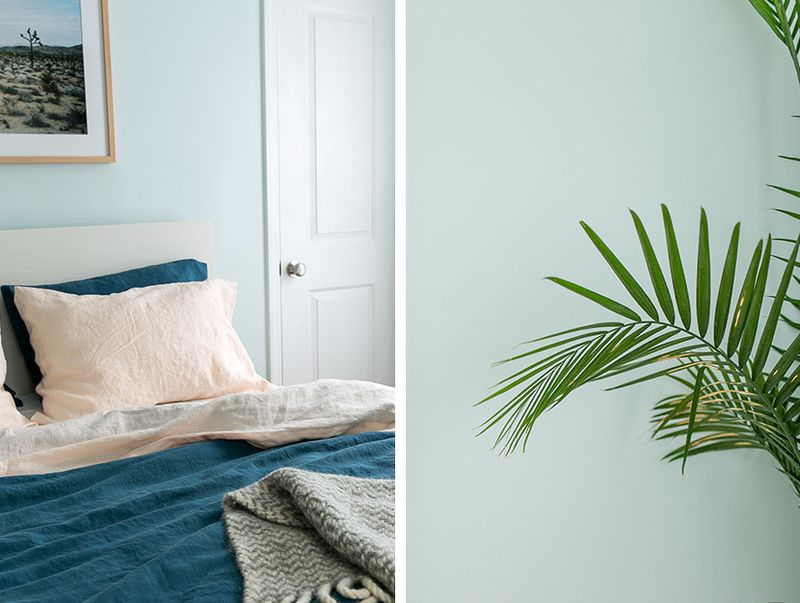 There are a lot of favorite parts of our updated room, but the main focus is on the paint color. Making a paint color decision was the hardest of all. We began with four colors painted in large swatches on the walls around the room on every wall since light shifts so much in our room. After about a week, we decided on BEHR’s Snowbound and Ultra Pure White for the trim and ceiling. The white previously in the room had far too much yellow in it. Choosing a white is very important to us, and BEHR knows how to make a great pure white. Snowbound was the right color for the room. At night, the color feels soothing and calm. In the morning, the light that streams in through our drapes reflects the most beautiful light onto the blue walls. There is no way you can have a bad morning in the light that fills that room every day. I wanted a space that inspired me first thing and pushed me out of bed ready to face the day. This room does that. 1. We went for a flat woven rug that stayed close to the floor. 2. 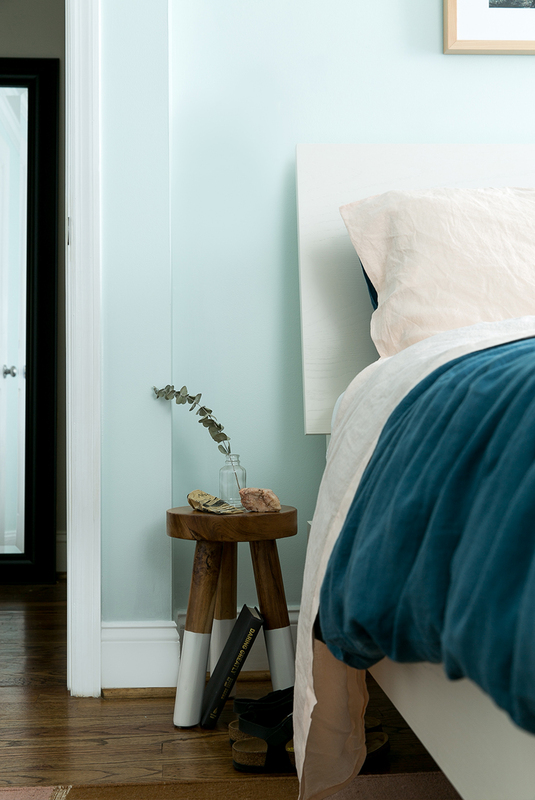 We chose a minimal bed frame such as this one from West Elm. 3. Replaced a large and low-hanging fan, though good quality, it visually overtook our ceiling. 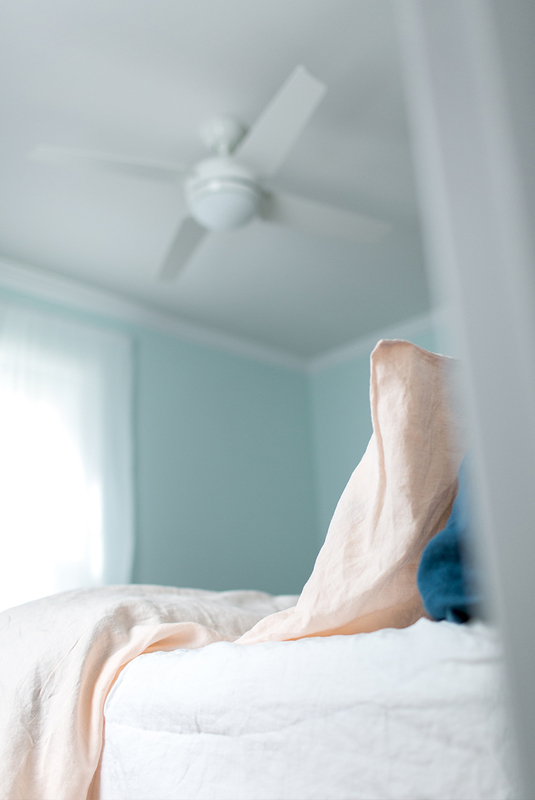 We replaced it with this minimal white fan, which now has a remote! 4. Removed the blinds and replaced with lightweight drapes that help to open the room with more light. 5. Removed our mirror (now in the hall to help extend the hall) and placed a dresser into our closet. This way we kept as much floor space as possible. 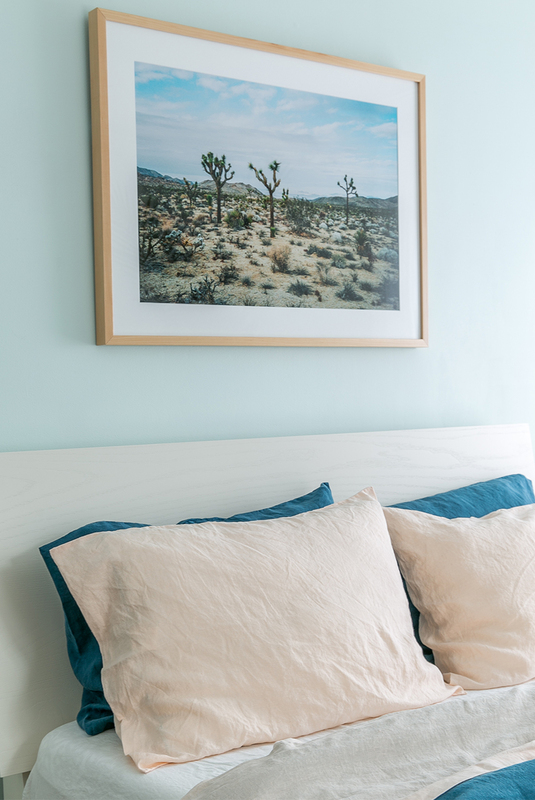 We framed the image of Joshua Tree from our friend, Michael Newsted with Framebridge in the Marin frame. 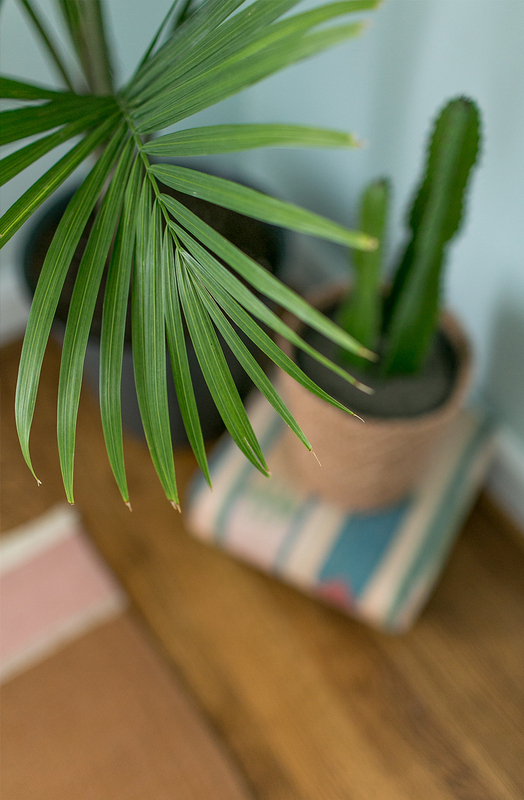 Since it is the focal point in the room and our inspiration, we chose textures, rugs, and accessories that played on that Southern California life. 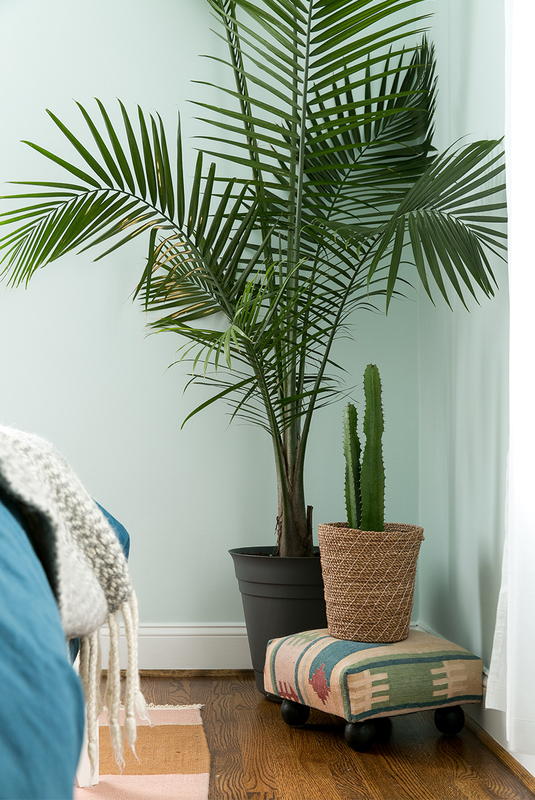 We pulled in our favorite cactus, a kilim stool (vintage from Father and Son in Raleigh), and a large palm to bring the feeling of outside into our room. The space next to our bed is incredibly small. 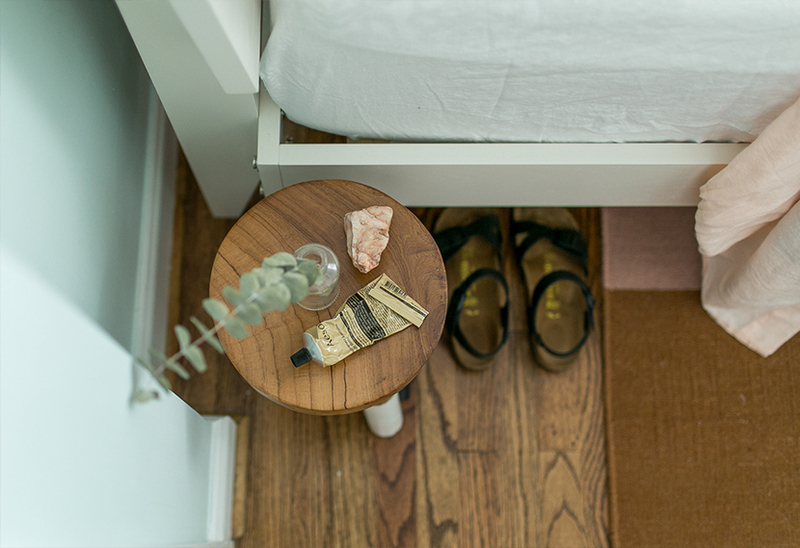 We searched the Internet for a side table option to fit in our less than 13-inch width space and ultimately decided to move our side tables from our guest room into our bedroom. The wood fit the feeling of the room, and they are just the right size. 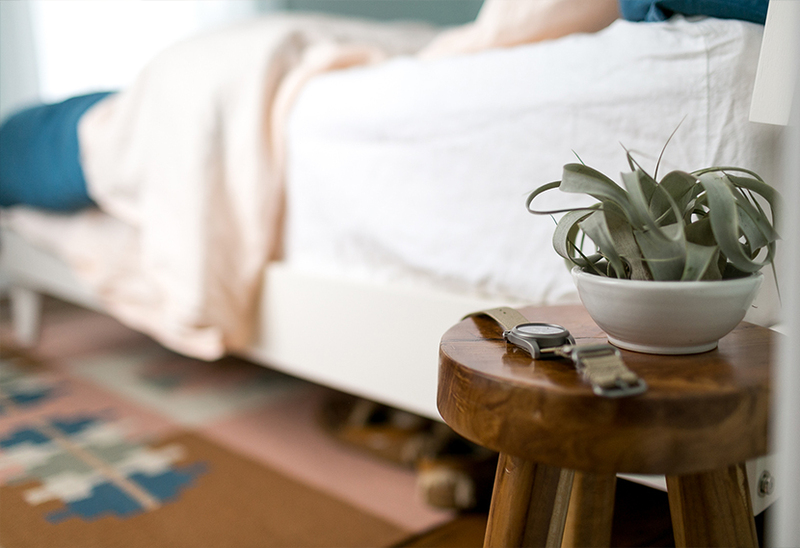 We love the look, and it helps us keep our bedside space tidy and minimal. 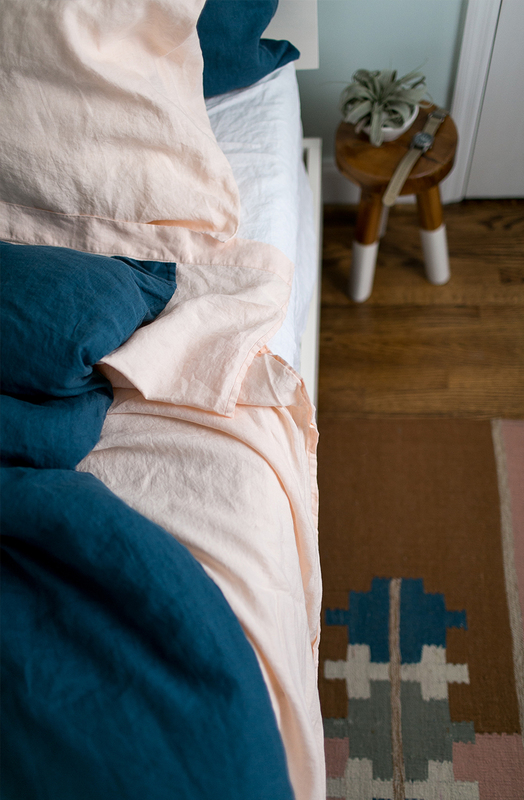 We put a lot of weight in deciding on bedding for the room. 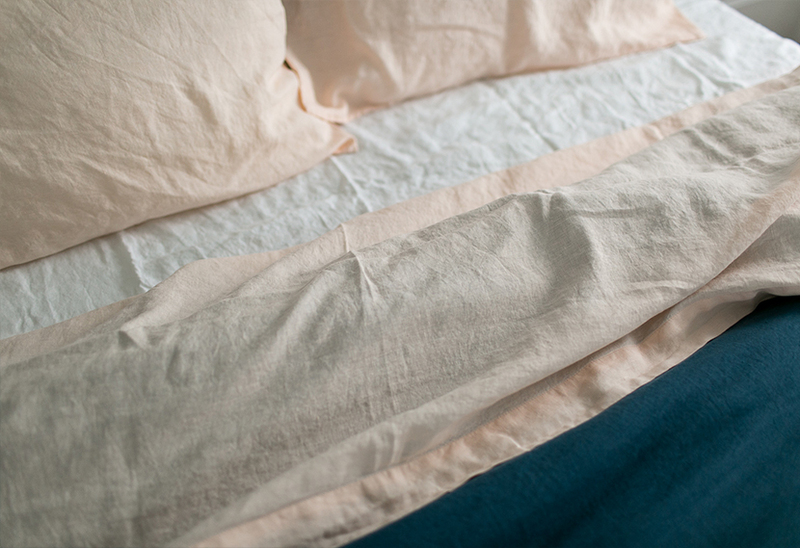 I have always wanted to invest in great sheets. It seems so adult to have that kind of luxurious feeling when you slip into bed at night, doesn’t it? So, we began researching, and we discovered In Bed Store based in Australia. Not only is their branding beautiful, but the colors are the perfect complement to nearly any room color you may choose. 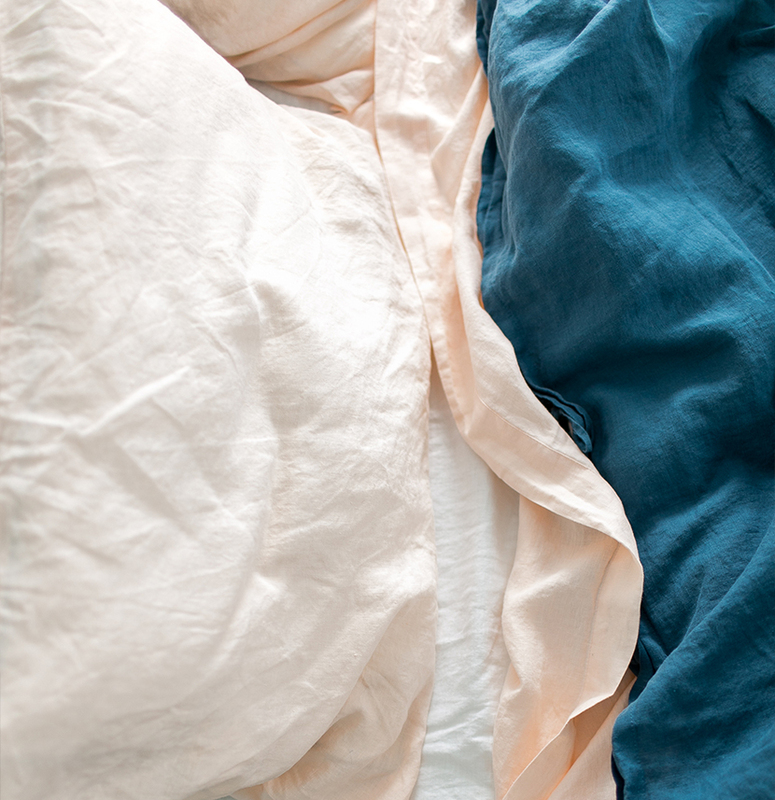 Each piece of the bedding is purchased individually so you can choose any combination. We chose, Indigo, Peach, and White as our combo and I honestly couldn’t be happier with it. 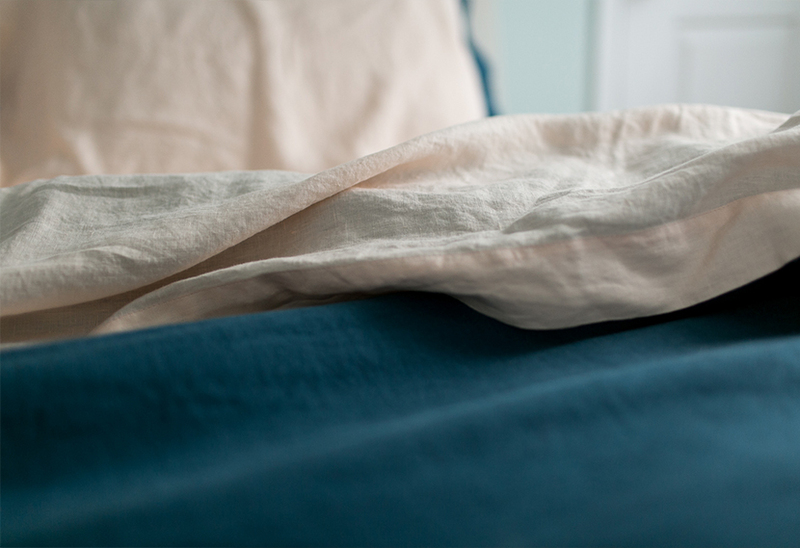 The linen is the perfect texture in the space, and the best part is it looks best when undone rather than perfectly made. You cannot complain about that, right? 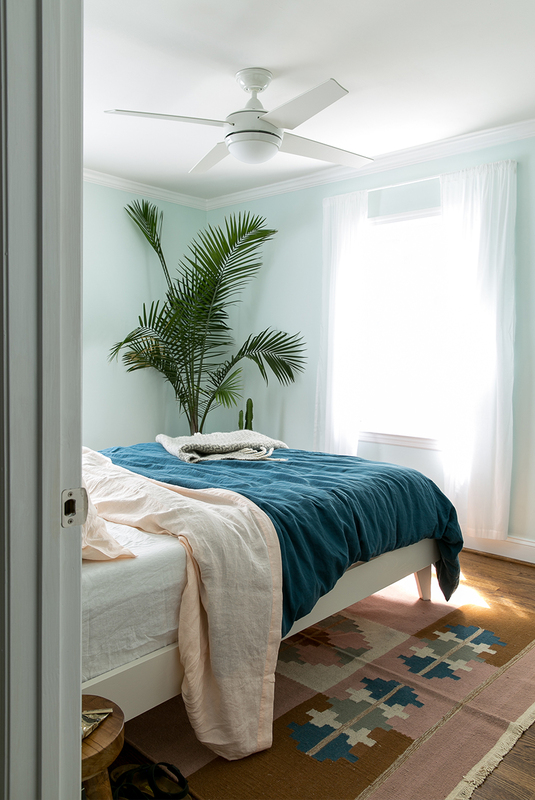 There are still a couple small things we want to figure out for the space such as side lamps and dog beds that fit well in the room. 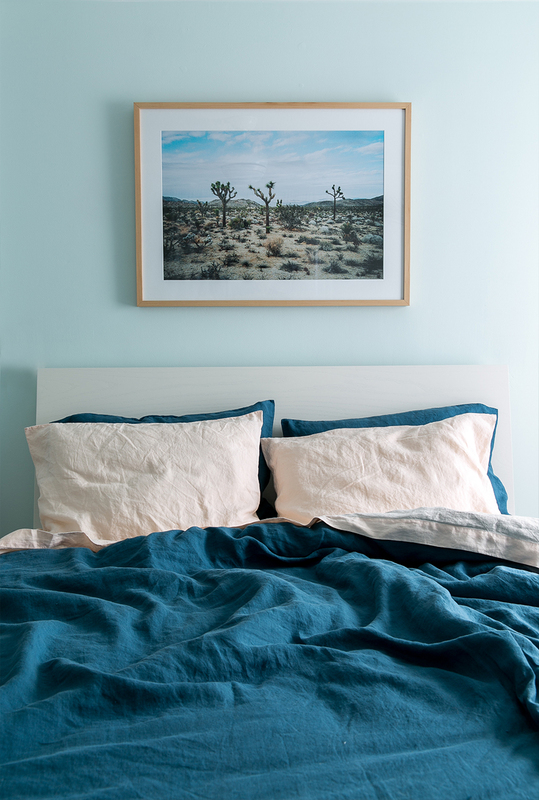 Those minimal pieces right now don’t feel like that big of a deal because the room as is in its simplest form is perfect. 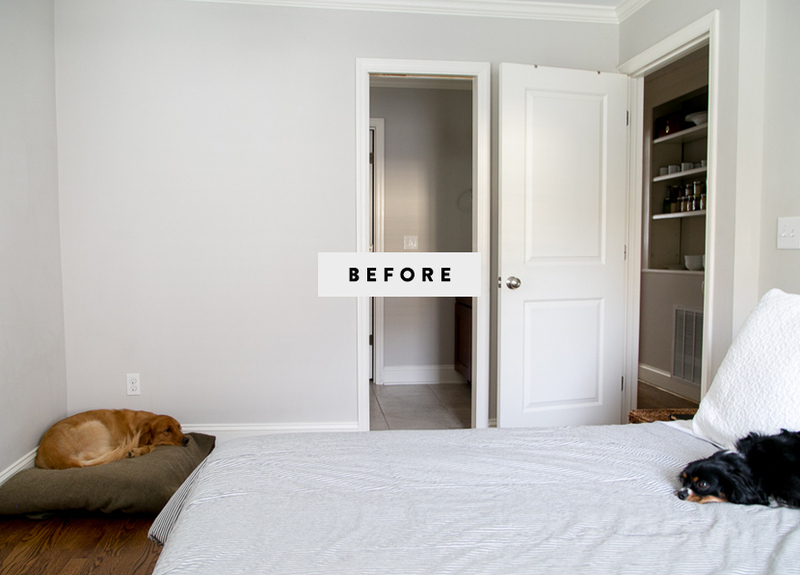 The natural, undone, relaxed, and bright space is a dream for us as we finally nail down our second space in the home. What do you think? 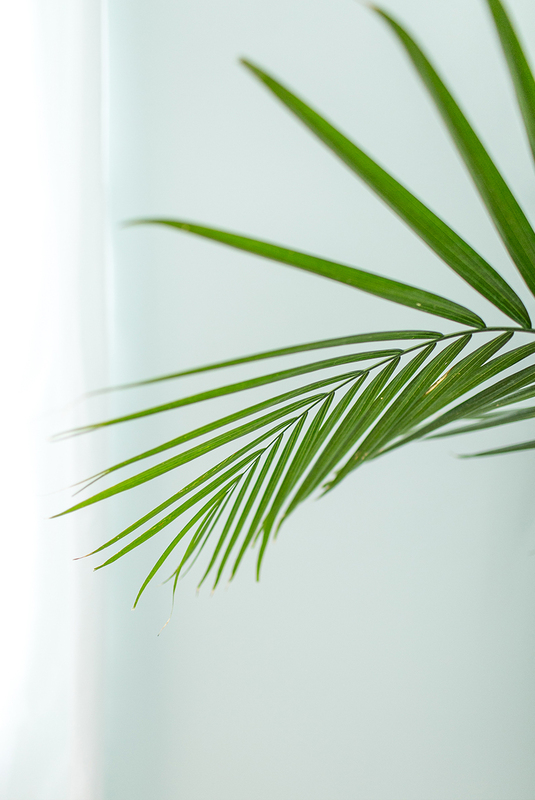 How close did we come to our mood board in our last post? I would love to hear your thoughts! Ive been looking for the perfect color to paint my bedroom and stuMbled upon behr’s snowbound, however i swatched A bit of it onto my wall and it didnt turn out Nearly as beautiful as yours. It’s extremely white with just a light tint of a mint toothpaste. I was just wondering if you had the color altered, or if you have an tips on gEtting the color to turn out its true color? Hi Jeralyn, so the color in our room sometimes shows up bluer than it actually is. We tried to make sure the photos captured the color as best as we could but it is hard. Paint colors are tricky and sometimes it takes a deep long hunt and lots of swatching the find the right one. One color can look one way in one room and another in another room. If you aren’t happy with the color. I would highly suggest taking it back to the paint story and seeing if they can help mix in more the chroma from a blue and green to give it the color you want.